New Delhi: The Union Cabinet chaired by Prime Minister Shri Narendra Modi has given its approval for moving official amendments in the “Surrogacy (Regulation) Bill, 2016”. The Surrogacy (Regulation) Bill, 2016 proposes to regulate surrogacy in India by establishing National Surrogacy Board at the central level and, State Surrogacy Boards and Appropriate Authorities in the States and Union Territories. The proposed legislation ensures effective regulation of surrogacy, prohibit commercial surrogacy and allow altruistic surrogacy to the needy Indian infertile couples. Once the Bill is enacted by the Parliament, the National Surrogacy Board will be constituted. The States and Union Territories shall constitute the State Surrogacy Board and State Appropriate Authorities within three months of the notification by the Central Government. Once in effect, the Act will regulate the surrogacy services in the country and will control the unethical practices in surrogacy, prevent commercialization of surrogacy and will prohibit potential exploitation of surrogate mothers and children born through surrogacy. While commercial surrogacy will be prohibited including sale and purchase of human embryo and gametes, ethical surrogacy to the needy infertile couples will be allowed on fulfillment of certain conditions and for specific purposes. All Infertile Indian married couple who want to avail ethical surrogacy will be benefitted. Further, the rights of surrogate mother and children born out of surrogacy will be protected. The Bill shall apply to whole of India, except the State of Jammu and Kashmir. 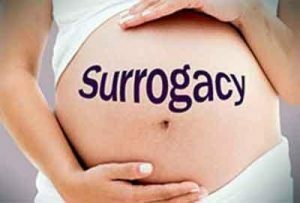 India has emerged as a surrogacy hub for couples from different countries and there have been reported incidents concerning unethical practices, exploitation of surrogate mothers, abandonment of children born out of surrogacy and rackets of intermediaries importing human embryos and gametes. The 228th report of the Law Commission of India has recommended for prohibiting commercial surrogacy and allowing ethical altruistic surrogacy by enacting a suitable legislation. The “Surrogacy (Regulation) Bill, 2016”, was introduced in the Lok Sabha on the 21st day of November 2016 which was referred to the Parliamentary Standing Committee on Health and Family Welfare on the 12th of January 2017. The Parliamentary Standing Committee held various meetings with Stakeholders, Central Govt. Ministries / Department, NGO’s, medical professionals, lawyers, researchers, commissioning parents and surrogate mothers for holding discussions and to receive their suggestions. The One Hundred Second Report of the Departmental-Related Parliamentary Standing Committee on Health and Family Welfare on Surrogacy (Regulation) Bill,2016 was laid on the Table of the Rajya Sabha and simultaneously on the Table of the Lok Sabha on 10th of August, 2017.